This project evolved in two parts, first we designed a new, LEED for Homes (GOLD certified) traditional style family home in a historic neighborhood. The result was a sunny, elegant yet informal, home based on traditional shingle-style forms with a casual, but classic, interior. The home was carefully sited on its sloping corner lot, using stepped terraces to anchor the house as well as creating separate areas for the pool, yard and garage entrance. 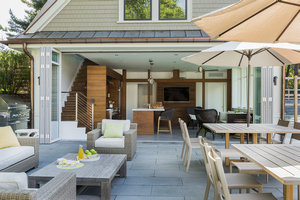 A four-season porch extends into the yard and frames a stone patio for outdoor dining and entertaining.
" The pool-facing folding wall seamlessly allows for the full expansion of the space from inside to outside – perfect for this active family." After completion of the main house and pool, the property to the rear went up for sale, offering our clients the opportunity to add a much-desired tennis court and expanded outdoor entertaining capabilities. The new property was carefully blended into the existing landscape design, creating an expansive yard/play area, tennis court, small putting green and a new clubhouse. The new clubhouse bookends the pool and terrace, extending the connection to the main house and adding additional entertaining space. With a full kitchen, indoor sitting room, changing area and laundry room as well as an outdoor terrace, the clubhouse can be the center of a range of activity, from sporting to socializing. 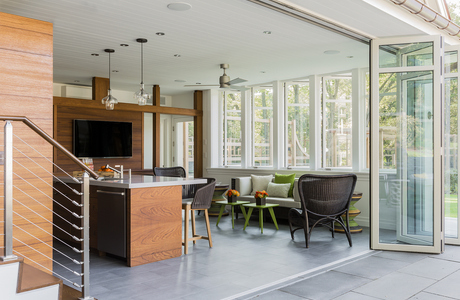 The pool-facing folding wall seamlessly allows for the full expansion of the space from inside to outside – perfect for this active family.